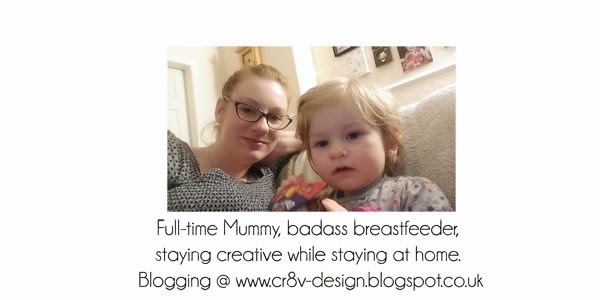 cr8v-design.blogspot.co.uk: 28 Weeks Pregnant With Baby Number 2 - Fetal Growth Scan Tomorrow! 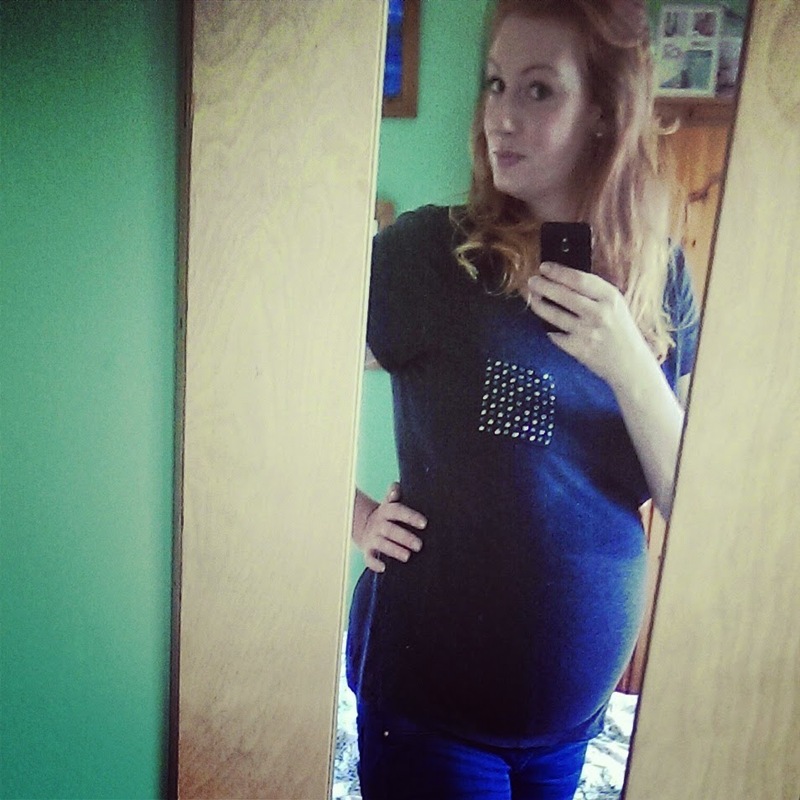 28 Weeks Pregnant With Baby Number 2 - Fetal Growth Scan Tomorrow! 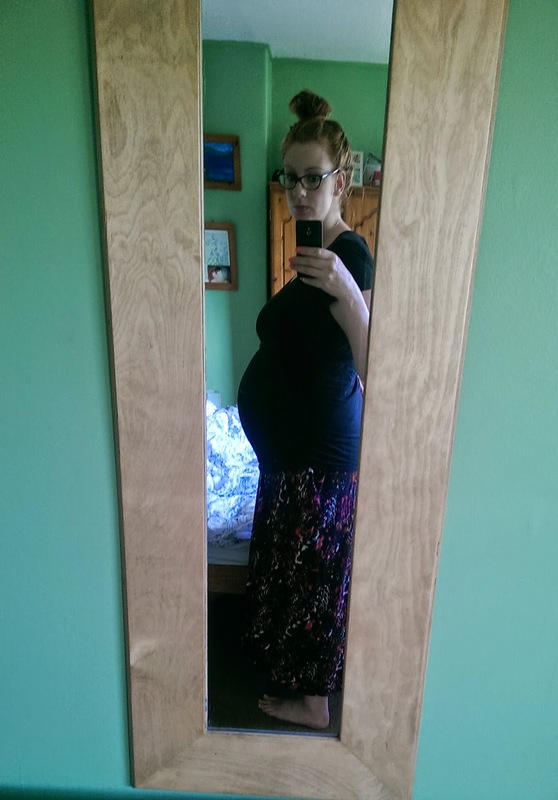 I hope to write about my pregnancy every two weeks, otherwise it can get a bit much. Haha. 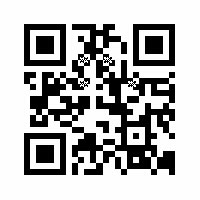 I think I might post a bit more come nearer the time but right now I don't feel much change to warrant a post every week. Comment if you want more though! I can't believe that's me in the final stretch. I think nesting has hit in a big way, if you read my last post you'll remember I wrote about rearranging the patio space and clearing out the house, well we finally took a car load of stuff to the skip yesterday and it feels so good having all these places in my house good to go. However, Martin if you are reading this, there is a lot more to do. I felt I stretched myself quite far and was pretty darn sore on Tuesday, I had to call the osteopath and she said I was quite out of allignment. My left hip was lower than my right, and since then it feels like the opposite to me, now my left hip feels high! Haha, don't think I was having a good week in the picture above! How far along? 28 weeks and 1 day! Total weight gain/measurements: No idea, as I said before I am not tracking it. I still fit into my regular size 16 maternity clothes. 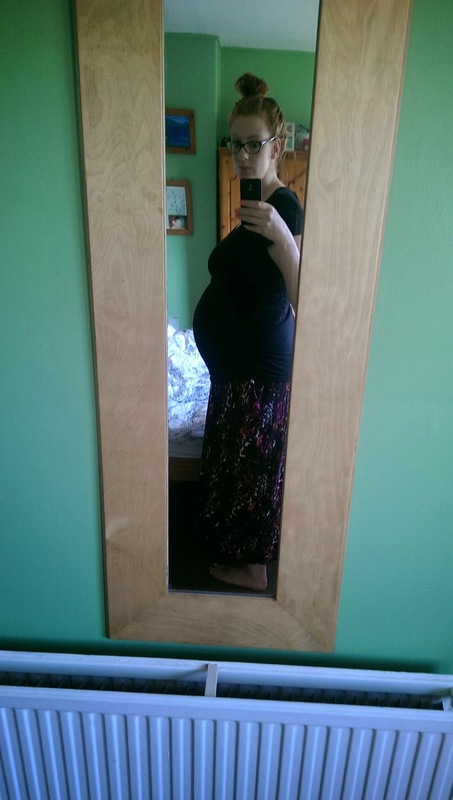 Maternity clothes: all the time, now the weather is a bit warmer I am also wearing maxi dresses as skirts! Sleep: OK,still waking once at night. Eva has had the cold for the last few weeks so sleep has been pretty disrupted for everyone. I am napping when I feel the need. Luckily I can sleep when she sleeps! Best moment this week: Yesterday, getting stuff taken to skip and visiting Martin's nana. Then coming home to have our new favourite meal of Basil, bacon and peach baked brie. Miss anything? My hips are aching these days so I can't wait for that to go. I know if I take it a bit easier than I have been I should feel better. Movement: Loads, whenever I relax. I try to relax often during the day so baby gets a chance to wake then and not at night and hopefully encourage good sleep habits! 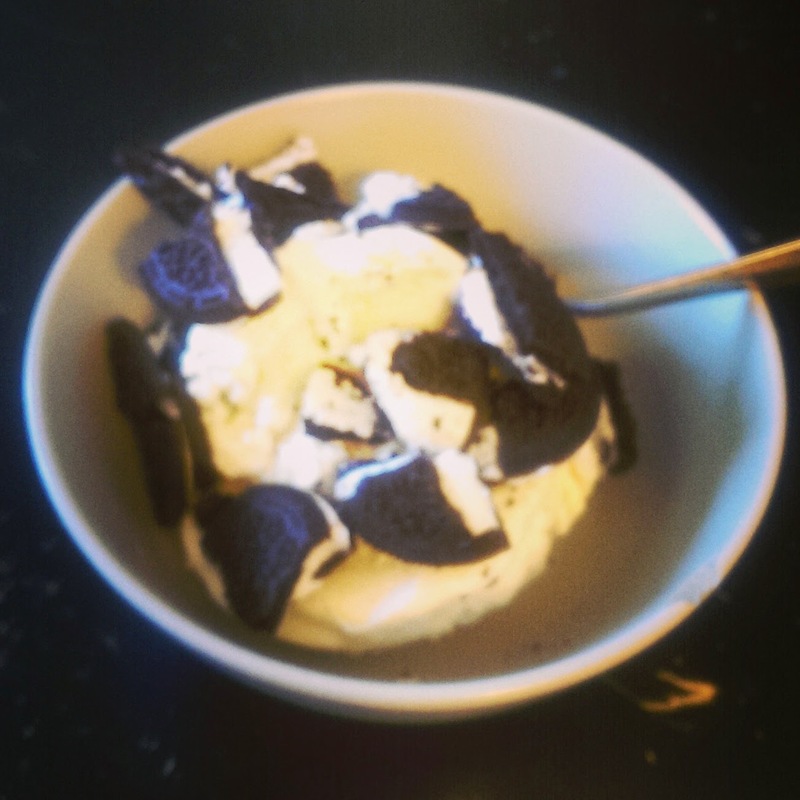 Food cravings: I've been craving funny things, like Oreo, marshmallow and white chocolate ice cream. Luckily Ben & Jerry's baked alaska and oreo cookies mashed up works! Gender: Girl. Should get confirmation of this at tomorrow's ultrasound. Belly button in or out? In, doubt it will pop, didn't last time! Wedding rings on or off? Off, still have fat, swollen fingers lol! Happy or moody most of the time: Generally happy, though I feel I am nesting lately so things are making me more emotional because their not done and I want it done yesterday. Looking forward to: I am and I amn't looking forward to tomorrow. 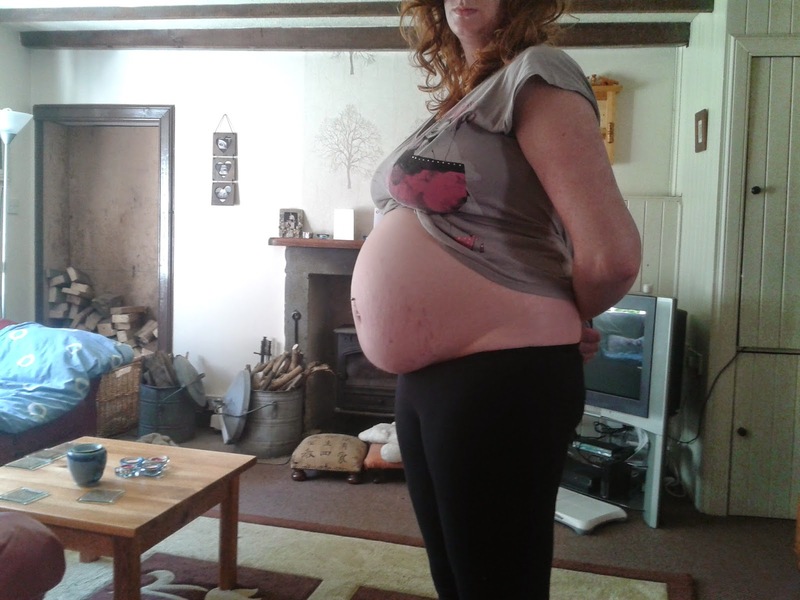 I am because we'll see our baby again, but I amn't because I need to persuade the OB to let me have a home birth. My reasons to have one are mixed and complicated. At the end of the day its my choice, and I will have a happier birth if I'm supported to give birth in my own home. Going to ask the OB and heamotologist to please support my decision and not to coerce or judge me. They can lay out the facts and we can have an open dialogue. However, I am this baby's mother and my baby and my own safety are paramount to my decision. 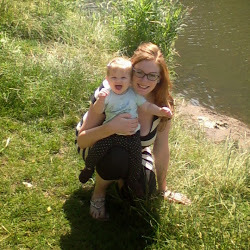 There is no one more aware of the risks yet I think the benefits of home birth outweigh any risks. I don't want to be made to feel isolated or threatened by these doctors, or be told I am putting my life and my baby's life in danger for my choice to give birth at home. At the end of the day that kind of judgement borders on bullying. My decision might be out of the box but it would be really helpful to have a discussion on how to safely support me rather than dismiss my wishes. Wish me luck for tomorrow, I still feel extremely overwhelmed by it all. It seems like everything I'm somehow doing is focusing on this baby's birth and it would be nice to forget about it all and simply go with the flow. It doesn't help having the hospital treat me like a lab rat. I should have refused this fetal growth scan anyway, it adds more stress on to me and the baby which isn't helpful for anyone. From what I can gather the ultrasound is such a bad tool in guaging fetal weight anyway so if they start mentioning that to me I can only divert them to discussing the whole reason for this scan, the placental function?? Also, the research I have read says its impossible to check placental function through a scan. To be honest, I want to trust my body to do the best for my baby. I have one healthy child already yet that fact is dismissed.